My girl crush on Jane Birkin is probably eternal, despite a rather dismissive interview published here. However, like any crush, you eventually have your head turned by others, and these days I–and many other women–admire American Linda Rodin, former stylist and model, current skin-care entrepreneur. "I don't buy anything I can't wash." She buys Uniqulo $39 jeans in quantity. "I’m a creature of habit, and I’m easy. I can’t bear to do anything with my hair—I’ve been wearing it up for the past 10 years and I cut it myself. I started going gray at 35, and I just let it go." "I can’t always afford to buy designers—unless they’re on sale... I only buy designers for very special things and for handbags and shoes." She mixes these with items from discounters, department stores, markets or little shops she finds on her travels, searching for pieces like the vintage Czech blouse, left. "I won’t wear high heals anymore–except maybe once a year—because I’m not comfortable. I love ballet slippers and Mary Janes and lace-up men’s shoes." Both are exemplars of unfussy, individual style that is the antithesis of the strenuously-preserved image some women in our cohort attempt in an effort to "look young". Yes, both have maintained their lithe model figures and have beautiful bone structure. They have access to fashion industry luminaries, which means deals, perks, gifts: considerable advantages. But let's not throw the beauty out with her bathwater: they have the eye. Each has a fondness for found treasures and personal objects, creating living spaces full of memories and meaning. For a peek at Rodin's NYC apartment, see this slideshow at refinery29, written by Christine Barberich. Each says that her approach is to float above the trends, to live with what they have become (though Birkin uses haircolour), to reject surgery on their faces. These are two cool girls, but also grown women. Should you stand next to them, they would look at ease. I like it, and I'm seeing it on the street more and more, regardless of size or shape. Is it me (or where I live?) or is there a shift to more natural-looking women past 50? And yes, both of these women exemplify what I think 50+ should look like. that should have read either--the size of my frame or because of my body type. Love reading these types of stories. Basically everything Linda said is my life now...however, like Birkin, I still color my hair...not sure when I will have the courage to stop. I do agree that when you chase youth...you look older. 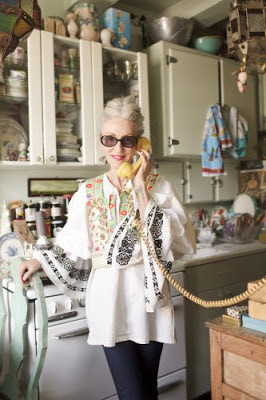 I especially see that with fashion selections some women over 50 make. Enjoyed this post immensely!! I worked in a friend's cosmetic boutique over the holidays so I was able to check out Linda Rodin's Olio Lusso brand in person. Unfortunately, I think it is a lot of marketing hype, and I honestly would recommend other products over these. But, I do agree, she is very beautiful and stylish! Just wanted to let you know that I have awarded your blog a "Very Inspiring Blogger" award in my latest blog post. I really appreciate your point of view and opinions on style! Thank you for the wonderful blog and I hope there will be many more posts to come. I actually find the very slim lithe body type is stereotypically rich old-lady. I used to be naturally anorexic thin in my 20s, gained weight in my 40s and lost it in my 50s. You look too "bird like" if you aim for the super slim look, you can see it in Linda Rodin when she wears skirts. Nancy Reagan and the Duchess of Windsor all had that same obsession with a skinny body type and no, it's not youthful. What is more attractive on me with a small body frame is what I call slim plus 10 pounds with an actual defined waist-to-hip ratio - most women are matronly because of no waistline not because of 10 extra pounds. The other big difference I see between boomer women and the 70+ group is they don't sign up for the ubiquitous men's wash and wear haircut or the poodle perms, many maintain longer hair. I love the eccentric living spaces also. We can only hope. No question that your stylist woman floats in the general ream I aspire to, with shorter legs and less tolerance for Bohemian. Bohemian, both in the boho and the Czech meaning:). I think what comes through with both of these women is a sense of ease and comfort as well as style. They are comfortable with themselves and it shows. It's that ease more than anything else that reads "current" to me. I completely agree with anon, I think that over 50 (huge sweeping generalistation I know, forgive me) women look better with a few pounds on them, just a few mind, that bony skeletal frail bird look that so many go hungry to maintain is so ageing. Must go check out Rodin's apartment, I like her style here. Oh goodness might have to lie down, it was like an explosion in a cup cake factory! I wish I hadn't read that interview with Jane Birkin you linked to - I think it might have ended my crush. Yes, both these women look great, but from what I've read, their incredible self involvement is quite a turn off. "Chasing youth" is all so relative. JB dresses very young, yet can pull it off beautifully because she has that long legged boyish frame. So it's all a fine line? I think that women over 50 look better with minimal make up. Skincare is very important and good skin is youthful. Skinny seems too gaunt on many older women it shows up on their faces more than women with a little extra padding. Jane Birkin certainly seems to float above the trends. It is interesting that many of our crushes are those who do listen to different drummers. Thank you for introducing me to Linda. Her decor is a bit out there for my tastes though! I hope so - and I love Rodin's facelift comment! Susan; Wish some of the great lifts were identified, as I think we have all seen the grotesque ones and do not even notice the artful ones. But I am terrified of it. Pam: I've been mulling for awhile whether it takes courage or just the right combination of gray and skin tone. Some of my acquaintances just plain got fed up with maintenance. Louise: Lucky you. I would *love* to try it, just curious- but not for %$150! Thanks very much for the award. Anon@ 8:20: I find a lot has to do with posture and vitality. I've seen the birdy women you describe but also some slim, vital women of 60+. A lot of it is manner. And as one wit said, a waist is a terrible thing to mind. frugal: Yes, though I couldn't live amid the clutter! LPC: I see the references between you two! Pseu: My late, wonderful hairdresser advised any woman considering going grey to wrap a grey towel or sweater around hear head like a turban and see how she liked having much less definition between her skin and hair. he was not against grey but said he re-coloured about half the women who tried it. Bourbon: I too think Rodin would look wonderful with more weight but remember, she is in the fashion world where being thin-thin is the thing; even if it doesn't look good to us, certain cultures really prize that. Kathy: I though it was kind of mean; Jane Birkin has been interviewed a zillion times and why should *this* reporter expect her to dive deep and reveal her innermost soul? When a subject is slammed for not revealing enough, I think, "Good for her". I guess Jane would have to spit in my beer for me to dislike her. hostess: While too thin is not a good look, the statistics indicate we, as a nation are moving in the other direction. That's not a defense of losing too much, just an observation that a lot of us are fighting creeping toward too much weight. Birkin has said she was once naturally thin but now has to really watch what she eats. Rodin claims to not diet and says has has 2 glasses of wine and a small piece of chocolate per night. That's Not My Age: I've heard Bobbi Brown say something similar, and it gives me comfort. Duchesse, I read the Birkin interview which made her look MOST unattractive as a person. I have to say that while she is cute, she has not aged that well if you look at the photos of her at a younger age. I could not even tell that she is the same person--must be all that hard living! About gray hair. I think those of us who are turning white, not gray, are a bit more fortunate. Yes, there is very little contrast with our skin, but it's still better than a steel gray. Also, you have to remember that most hairdressers have a vested interested in continuing to do color for their clients. Perhaps the gray towel test is not entirely accurate. My issue with colored hair on older women is the harshness. I've seen a few color jobs on older women that looked good, but usually only on those who have gone lighter than their natural color. I know there must be exceptions though. The MOST important thing is to be happy with your choice. I don't know that others would choose the route that I am going with my hair, and the good news is that they don't have to! Great post as always, from now on I will adopt your rule of avoiding any shop where you cannot imagine to run into xyz. Translation: most of the $500 goes into the pockets of owner, retailer, some for marketing and packaging and more than 95% of the remaining few dollars is (drum roll please): water, glycerin, some algae (forget La Mer, algae are not skin care miracles), paraffin (think baby oil) and some potato extract (yes potatoes!). The rest (5% or less) is some silicone oil, some Vitamin E (mostly to protect the product from oxidation), preservatives (Phenoxyethanol, Sodium Methylparaben, Sorbic Acid, Tetrasodium EDTA, Chlorphenesin, Methylparaben, Ethylparaben, Butylparaben, Propylparaben) and fragrance (Fragrance (Aroma), Linalool, Limonene). It is an outrage, it is almost robbery! I have studied cosmetics chemistry and you have to believe that not one ingredient in this can transform or even improve your skin. Not one ingredient is worth even a faction of the outrageous price, not one iota of research went into formulation. Clinique, Estee Lauder, Olay and Neutrogena (and many more brands at department stores and drugstores) have much much better formulated products at a fraction of the price. Please believe me when I say I have no agenda here. I have nothing against Sisley, I am not going to promote any other product, I am not gaining anything from writing this (if anything I am spending my time) but it saddens me that you possibly think Sisleya is the way to good skin just based on an image. Rodin's oil is not much better for the record. Some great plant oils which would be less luxurious but much better for skin without the fragrance. Not as special as they want us to believe and still absurdly overpriced. With some basic knowledge you can spend that $500 on an entire regimen with great products that will have a proven benefit for your skin and will last you more than 6 months, even a year. i.e. : On the contrary, I thank you for your careful dissection of Sisleya. I use mid-priced drugstore products (Nivea,Boots) because- like you (but lacking the technical knowledge)- I find skin products shockingly overpriced. But I have several French friends who swear by Sisleya and Birkin, in an interview, said it was "the best, but so expensive". Rodin always mentions the Triad facials she gets from Dr. David Colbert- I was also thinking of their access to treatments as well as products. Yikes, she has a cluttered apartment. Or at least cluttered in things I loathe like lots of mismatched glasses. Being there would make me anxious. Rodin has to have "thin genes" regardless of her diet. Even if she is eating a healthy Mediterranean diet, or actually "eating" something, she's so thin. At least she has a bit more on her arms and legs than the frighteningly ropy Madonna. I have a rule of thumb - when I can see your tendons and blood vessels that clearly, I'm scared. Artful Lawyer: I could never live with that amount of stuff and detail but had fun peeking. Julia Llewellyn Smith is a young woman. 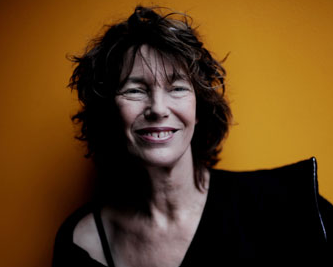 The article on Jane Birkin reflects the judgements of today on the customs of the past. As a young woman Jane behaved as many of us were taught to - please the man- coupled with the freedom of birth control for the first time. Llewellyn Smith seems herself to be to be narcissistic and resentful of a woman who doesn't notice her much.I am suspicious of her motives. I have found that the problem with white/grey hair is that between the age of 60 and 70 - it makes you look older. I went white at 35and I loved it through to 60. Then I would go places with my sister - one year younger with colored hair - and everyone would think I was her mother. At 61 alopecia set in so for the last 9 years I have been blonde (wig)and no one thinks I'm my age. diverchic: I had pretty much the same take, thought interviewer was annoyed with Jane for not 'confiding' in *her*. ming: A young or even midlife person with grey hair often looks novel and exotic, a 60+ person with grey hair just looks their age. Nothing wrong with looking one's age, but we do lose the effect of originality. While these women's style is not my own, I really like the whole idea of simply being "yourself," in a compleat package. I feel sad for those who keep trying on new styles (of hair, of clothes, or anything) to try to find out who they are to be a bit discombobulating. I told someone today that my goal in life is to be as comfortable in my work clothes as I am in pajamas, even when dressed up. That's why I loathe suits and blazers. But my "uniform" of turtleneck cashmere sweaters, button downs, skirts or trousers with moderate heels or loafers suits me, as does my sunscreen/mascara/red lips. Simple. Uneventful. But so much more impactful than those who try too hard. While I admire Birkin's attitude with aging I can't help but cringe a little whenever I see her wearing a low cut top that dips down almost to her navel or one that is slouching too far off the shoulder. There is a recent movie that she is in involving a carnival - sorry I forget the title. In this film she is braless and wearing the aforementioned top throughout. I'm sorry but it made me feel a bit sad for her because it seemed like such an overt attempt at "sexiness." Besides that though I think she is gorgeous. Gretchen: My, you sound chic! Anon@8:52: In a movie I doubt she is dressing herself; that sounds quite unappealing for any mature woman. Duchesse, I wouldn't say chic...content and comfortable enough to accept that wrinkles and a bit of squishiness are far less important than finding joy in the uncomplicated! I enjoyed this post a lot, I find both these women worthy of a second look, and a bit of thought to what makes them so attractive. Seems to me that health and attitude are key factors to aging gracefully. Moving with vitality, and being interested in what is going on around you will always be attractive, but is perhaps harder to maintain than going for the bottle of hair dye. My mother-in-law is my best role model. She kept going at break-neck speed (travel and politics) until the age of 87, when her health started to go. She is still with us at 93, still living independently in her own flat, still as sharp as ever, but she looks her age now. I am determined to keep moving as long as I can - that´s my personal plan for the approaching old age. At some point, what you stop doing, you stop being able to do. Viktoria: Agree mobility is enormously important. Women should pay attention to bone density and range of motion, but we tend to fixate on weight. My mother was intellectually sharp but increasingly frail till she died at 99; one of her greatest regrets was having to give up bridge because she could not sit for hours at a table. She did not lost significant mobility till about 96, after a fall. I'm grateful that more women over 50 are modeling a more contented, "natural" aesthetic. Gives me something to look forward to (I'm 44). women. They seem different in many ways. My example of a woman of our age is Inez because of her joy and happiness and freshness. However there are women that I come into contact with on a daily basis that I learn from and admire and my hope is that I do the same for them. Anon@7:36: I'm not sure who the Inez is to whom you refer; is it Inez Andrews, the singer? Duchesse - me too on Clinique's Turn Around cream. I'm convinced it's permantly faded an age spot. And it just made my face look softer, dewy and less wrinkled while I was using it. I need to travel so I can get some on duty free! Also, I'm going to keep colouring my hair for ever (or at least for ages) as I think grey hair only looks good on about 5% of the people who have it. Mostly it just looks old to me. Eleanorjane: Perhaps we have similar skin? I have tried endless list of products, from basic to ultra high end, and that is the sole that made an observable difference. Lucky you to get it duty-free! They are both interesting and appealing, and yet, I wish there were more less-than-rail-thin women out there to admire. Is recherché a compliment or a put down? I looked it up and it's not at all clear. Sounds like it might mean crossing the line between refined and overrefined. Susan Partian: I use "recherché" to mean "studied" or "approached through careful deliberation". While Birkin often looks blithely unconcerned with her clothes (probably not the case, though), you can see the thought in Rodkin's outfits. Thank makes sense, and I see what you mean. I will say loudly with a same voice to Susan that "This is such a great post today. I enjoyed reading the dismissive interview and seeing the NYC apartment (which was also a bit cluttered for me, but still quite interesting.)" 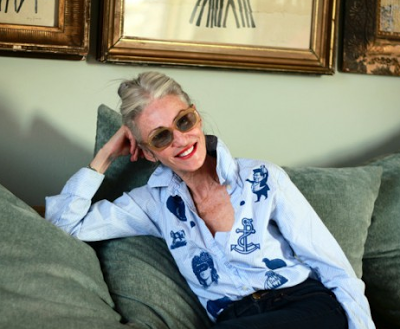 Thanks for sharing Linda Rodin with us. She is really an inspiration. While looking at photos online I noticed she wears a lot of tinted glasses. Not sunglasses, but lightly tinted glasses. I like the way it looks, but am wondering if I could pull it off, or actually, if anyone living a less urban and stylish life as Linda, can. What do you think. cgk: One of her signatures; she has said therefore she doesn't need eye makeup! I've seen barely-tinted glasses in the sunglasses section of every department store this spring. Why not visit a store, try on a pair and see if you like them? If you need prescription lenses, I'd experiment that way first as it's a big investment. Thank you Duchesse, I will do just that! I worry I will look like an has-been rock star, but a little experimentation never hurt anyone.